As a mother, a wife, and a businesswoman, Kaia Roman always had a plan. But when her biggest plan, the business she cofounded, collapsed, Kaia found herself crushed by depression. And what felt even worse was that, with a husband and two kids relying on her to get out of bed, she didn't have a plan to move forward. Determined to turn her life around and put her ingrained habits of stress and anxiety behind her, Kaia decided to put everything else on hold and dedicate thirty days to the singular pursuit of joy. The results were astonishing-and lasted much longer than the initial monthlong project. In this uplifting and eye-opening memoir, Kaia uses her business savvy to create a concrete Joy Plan to get back on her feet fast. Using scientific research on hormones, neurotransmitters, and mindfulness, along with the daily dedication to creating a more joyful existence, Kaia teaches readers how to move past temporary happiness and succeed in creating joy that lasts. 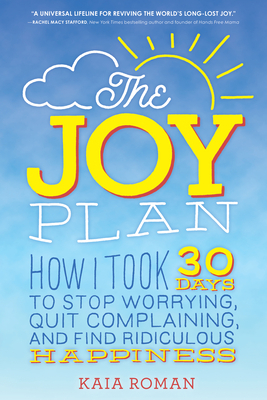 Complete with advice, exercises, and key takeaways, The Joy Plan is Kaia's step-by-step guide to how she, and everyone else, can ditch the negative and plan for the joy in their lives.